The Unpleasant Design blog, run by Gordan Savicic and Selena Savic, hosts examples of how design can manipulate people and their behavior in public places, by making things they might want to do, well, unpleasant. It's a workable substitute for active enforcement (or fixing the core causes of some of these behaviors), and yields some interesting designs. 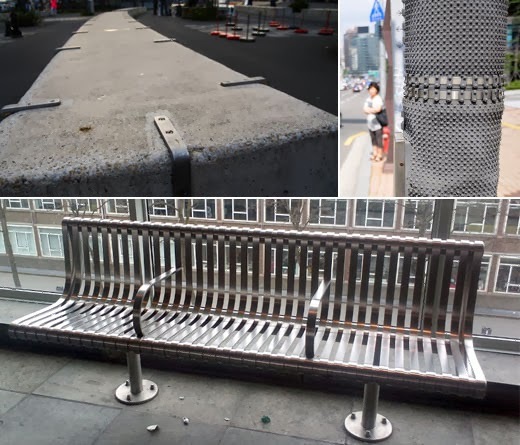 Seen here are anti-skateboarding metal strips, anti-posting textured pole covers, and anti-bum-napping armrests on benches. There's plenty more on their blog, if you feel like slumming among the less desirable human behaviors!